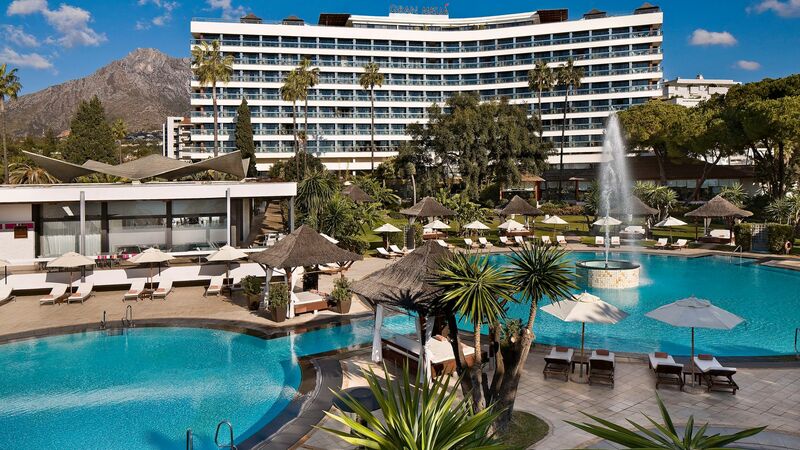 Beautifully positioned on the water’s edge, the renowned Gran Melia Don Pepe offers an enchanting atmosphere, just a short stroll from Marbella’s fashionable centre. Style, comfort and luxury pervade, with beautiful views across the Mediterranean. Guest rooms and public areas feature elegant yet contemporary décor while at the poolside guests can lounge on Balinese four-poster beds. The hotel's spa provides the ultimate in relaxation and a wide range of beauty treatments. 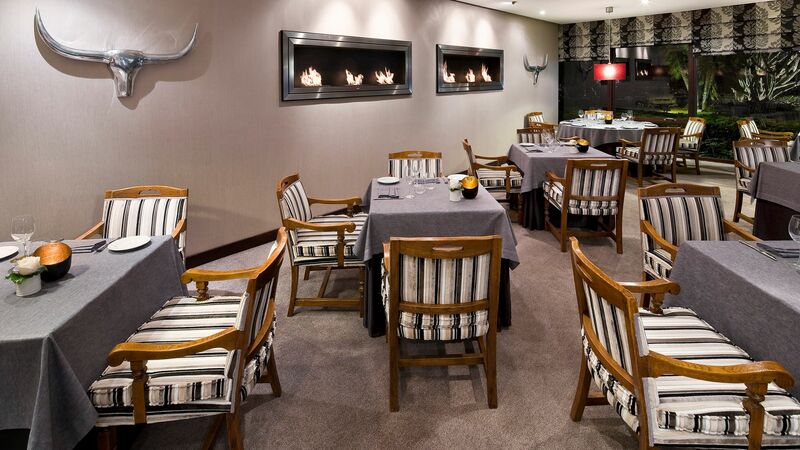 Enjoy the excellent choice of restaurants including the T-Bone Grill and Oyster & Caviar Champagne Bar. The hotel has 194 rooms, 8 floors and 3 lifts. Specially modified rooms for people with reduced mobility are available on request. The Capuccino Beach Club is located next to the Paseo Maritime with views over the Mediterranean Sea and serves a selection of international cuisine, snacks and cocktails. 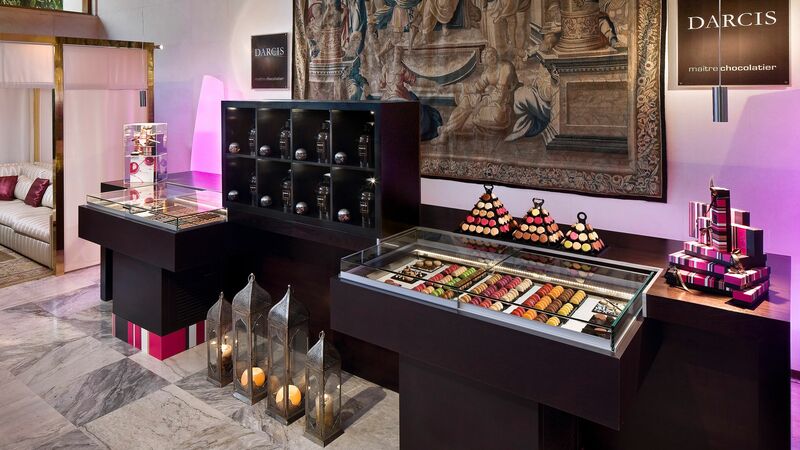 Darcis is an artisan confectionery serving an array of ice creams, macaroons, waffles, smoothies and Belgian chocolates, run by one of Belgium's finest pastry chefs. The T-Bone Grill is a Basque à la carte restaurant specialising in the finest meat dishes but also offering salads, rice dishes and fish. 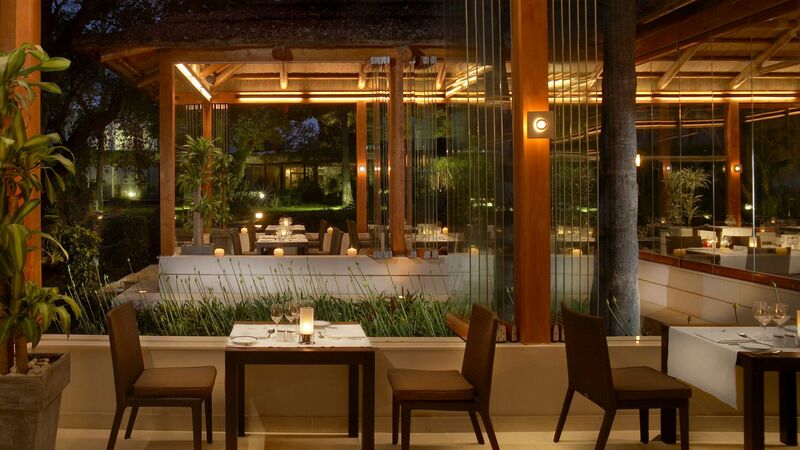 Veranda is the hotel's breakfast buffet restaurant located within the beautiful gardens and offers a selection of international and Mediterranean dishes, as well as show cooking stations. 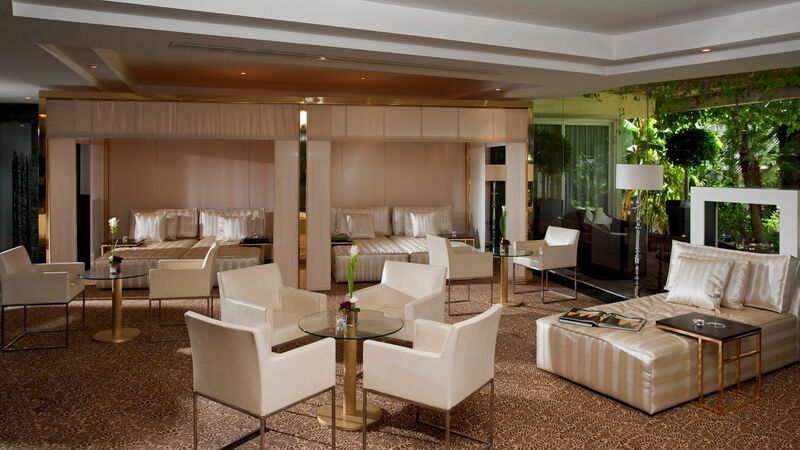 The Whisky Lounge is a large contemporary area designed for enjoying a glass of fine wine, delicious cocktail or one of the many eclectic choices of whisky. 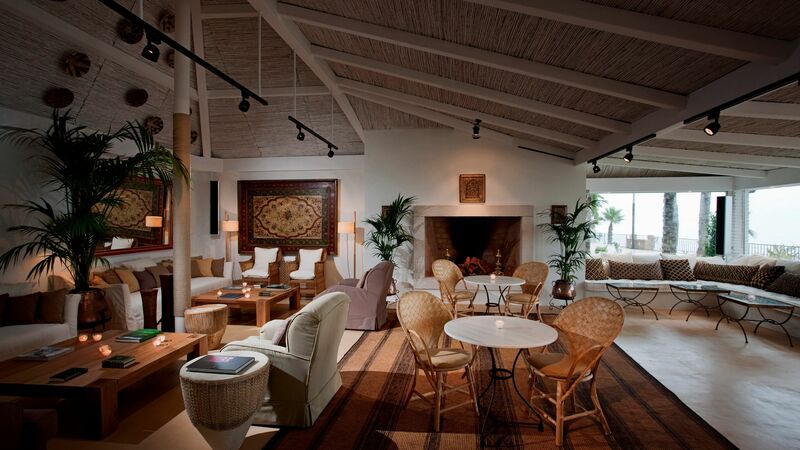 The bar features occasional live music and is ideal for winding down after your evening meal. The Oyster and Caviar Champagne Bar is an exclusive lounge area where guests are invited to enjoy the finest selection of caviar, sushi and oysters, accompanied by a glass of champagne. Located within the hotel's lobby, the soft lighting and comfortable furnishings, ensure that this is a truly indulgent treat. The Tahini Restaurant and Sushi Bar offers elegant Japanese cuisine in elegant surroundings. 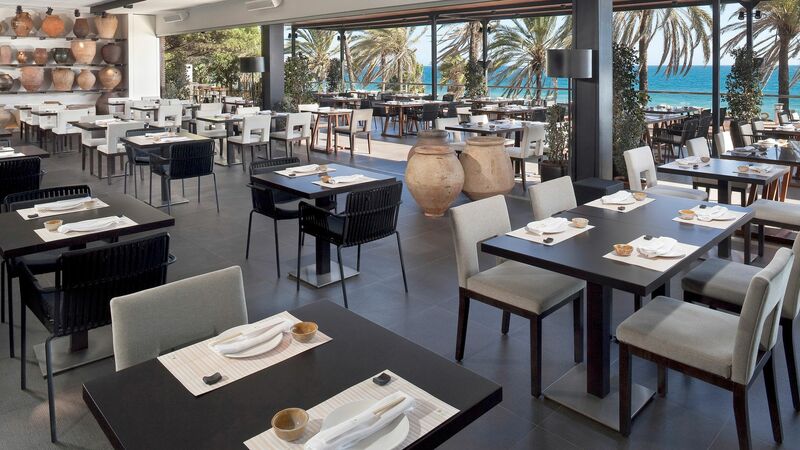 Within the restaurant there is a large terrace area where you can dine al fresco and enjoy the views of the local scenery. 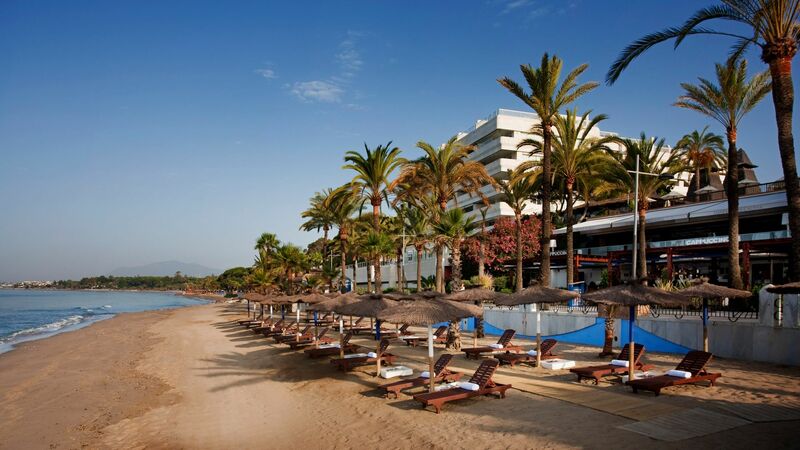 The beach lies directly infront of the hotel with access via the seafront promenade of Paseo Maritimo. The hotel's main pool area is furnished with Balinese four-poster beds making it an ideal spot for relaxation. The hotel also features an indoor pool and a children's swimming pool. 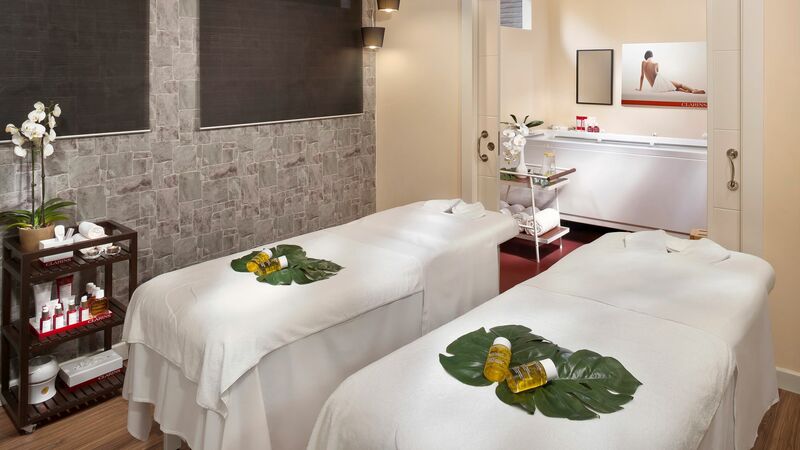 The Spa by Clarins® provides an array of treatments from relaxing massages to indulgent facials. The spa area is well equipped with a sauna, steam bath, hydromassage and heated indoor pool providing the perfect relaxation experience. Guests over the age of 16 are welcome to use the spa. Some treatments are 18 years+. Marbella is where you do the Mediterranean in style. This glam resort is the jewel in the Costa del Sol's holiday crown, so it's no surprise that it's a playground for the rich and famous. The marina is a hot spot for sitting in quayside cafes, gazing out at the glossy white yachts and celeb-spotting. 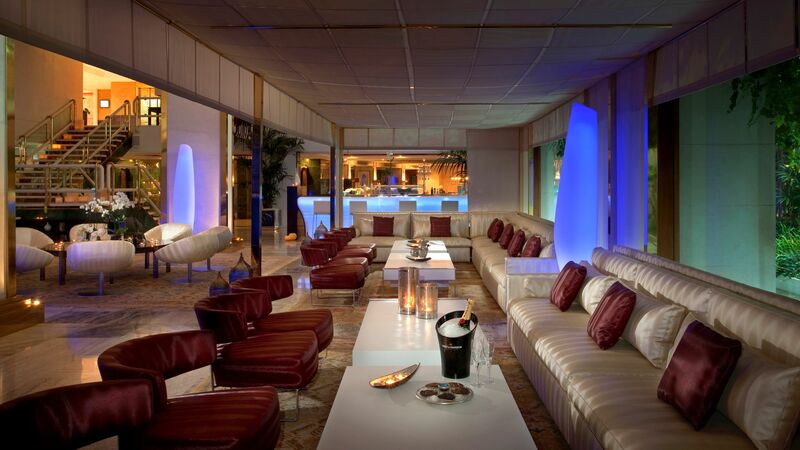 When the sun goes down, the famous Golden Mile comes alive with a string of chic restaurants, hotels and exclusive clubs that stretch all the way to neighbouring Puerto Banus. The sweeping palm-lined beaches are the perfect place to work on your tan - the best way to enjoy them is at one of the ultra-exclusive beach clubs, where you can relax, drink and dine in style. Marbella's charming old town is one of the prettiest in Andalucia, with whitewashed buildings and narrow, winding streets dotted with tapas bars and upmarket boutiques. At its heart is Plaza de los Naranjos, a classic Andalucian plaza with a cosmopolitan flair where locals and celebrities rub shoulders over tapas. These elegantly decorated rooms feature twin beds and benefit from spectacular views of the Sierras de las Nieves. These spacious rooms benefit from beautiful views of Marbella beach and feature twin beds. Guests have the option of upgrading to the Red Level at a supplement. Red level extra facilities include; Nespresso® coffee machine, exclusive access to the Red Level Lounge with drinks and snacks served between 11:00 - 21:00 and an open bar from 18:00 - 21:00, a Cocktail from Salazonia Bar everyday from 12:30 - 20:30, fragrance and pillow menu, one garment ironed per room per day, 30 minute tennis class per stay, Red Level bathrobes,. Other facilities are available on request (and subject to availability) including iPod® docking station, Wii™ and PlayStation™. The interconnecting rooms at the Gran Melia Don Pepe consist of two Double Premium Sea View rooms. These bright and generous rooms are located within the corners of the hotel and feature two terraces with views of the Mediterranean Sea, the centre of Marbella or Puerto Banús. The rooms have a comfortable lounge area in addition to the large sleeping area and luxury bathroom. Red Level Service is included for guests staying in a Junior Suite and is available as a supplement for Twin Rooms. Extra facilities include; Nespresso® coffee machine, kettle, exclusive access to the Red Level Lounge with a TV, library, board games and food and drinks served between 11:00 - 19:00, private check-in and check-out area, pool concierge, fresh flowers and one garment ironed per day. Other facilities are available on request (and subject to availability) including iPod docking station, Wii™, PlayStation™ and tennis class. Save up to 15% on the hotel price for holidays between 01 May - 31 October 2019 booked by 28 February 2019. Sovereign guests will receive a complimentary bottle of sparkling wine in their room on arrival for holidays between 01 November 2018 - 31 October 2019. Guests receive free entrance to the spa, including the use of indoor pool, sauna, Jacuzzi® and showers for holidays until the 30 April 2019. Honeymooners receive a bottle of sparkling wine and fruit basket in room on arrival plus a dinner for two (excluding drinks) for holidays until the 31 October 2019. (subject to a minimum stay of 5 nights, marriage certificate no older than 2 months required). Weather was against us and temperatures in the Hotel were too low as a result. The Staff were without exception, outstanding. Food and drink were well up to the mark. The Red level room facilities were in some ways idiosyncratic such as the light controllers, gown hangers hidden behind the lavatory door and nowhere to hang wet towels to dry other than the existing inadequate freestanding towel rail. This was an excellent break for us both. The Red Level is certainly a major benefit. The hotel is very well appointed and high quality. We tried all the restaurants and we were very impressed by the quality of the food, preparation and presentation. We would certainly recommend this hotel. Philip and Liz. My wife and i stayed for 7 nights until the 3rd April 2019. We found the experience both relaxing and a luxury experience We paid extra to have RED level and I can only recommend, we stayed on 6th floor ,sea view, really beautiful with small terrace I have decided to work harder to allow me to return again in October A special mention to 2 members of staff that made an impact Irene who worked in Red level made every effort to make our holiday special and Araceli who always came over asking if we needed anything ...very happy, smiling and helpful person -well done both Can I make one suggestion - My wife is in a wheelchair and we would have loved to walk on the board walk but could not as access is not at all possible,a lift takes you to the Japanese restaurant but your then faced with 15 stairs ....not possible Any chance of a ramp instead of two sets of stairs ? We tried to use the river walkway beside the hotel but the surface is so uneven we returned to the hotel and took a taxi instead to the boardwalk Overall We cannot wait to return again -Thanks again folks!! Myself and my husband had an excellent stay. From check in to check out we had a great time. The staff are so accommodating and helpful. The breakfast was fab with such a great selection. The whiskey bar was great to chill out in in the evening and the spa has a great selection of treatments. The restaurant at the bottom of the steps just outside the hotel is a great place to chill out and watch the world go by. I would definitely return to this hotel and have no problem reccommending it. Unfortunately it was too cold to enjoy the pool but the pool area would be lovely to lie around and chill. Beautiful hotel, clean and luxurious rooms. Sea view balcony stunning. Breakfast choices amazing and fresh. Indoor pool great and outdoor pool nice to look at but slightly cold. Would definitely be back. Thanks.